Our condo on Oahu, Hawaii, was on Sunset Beach. It was the perfect place and we love the North Shore! Best surf ever! Aloha! 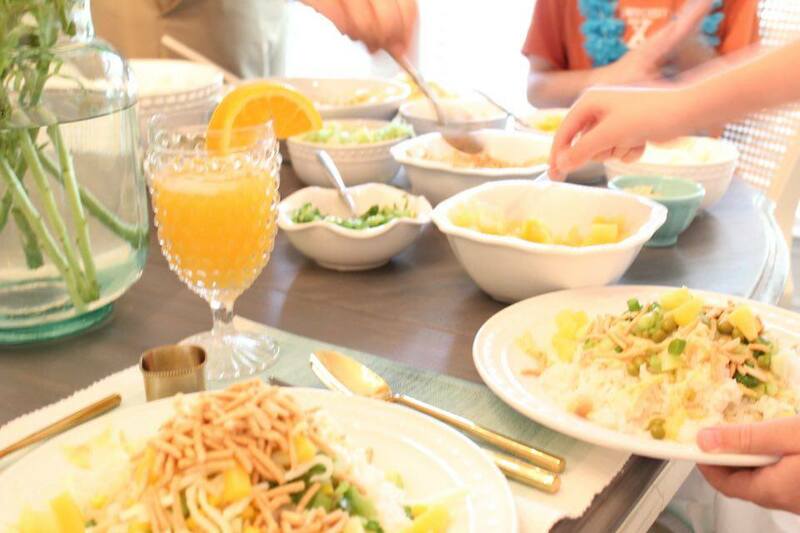 Join us for a stay-at-home luau as we tour the Polynesian Islands! Sort of…ha! In May, Josh and I went to Hawaii and decided to leave the kids since it was the end of the school year and they really couldn’t miss. They were NOT happy! While they understood the reason, they have tried to make us guilty ever since and keep complaining that we left them behind while running off to Paradise. I actually felt bad for them and decided that for Monday night’s dinner (our weekly Family Home Evening time anyway) we would have a luau. When Brooklyn and Beckham came downstairs, I had my Hawaiian playlist going and Josh and I gave them each leis and welcomed them. They got sooooo excited!! 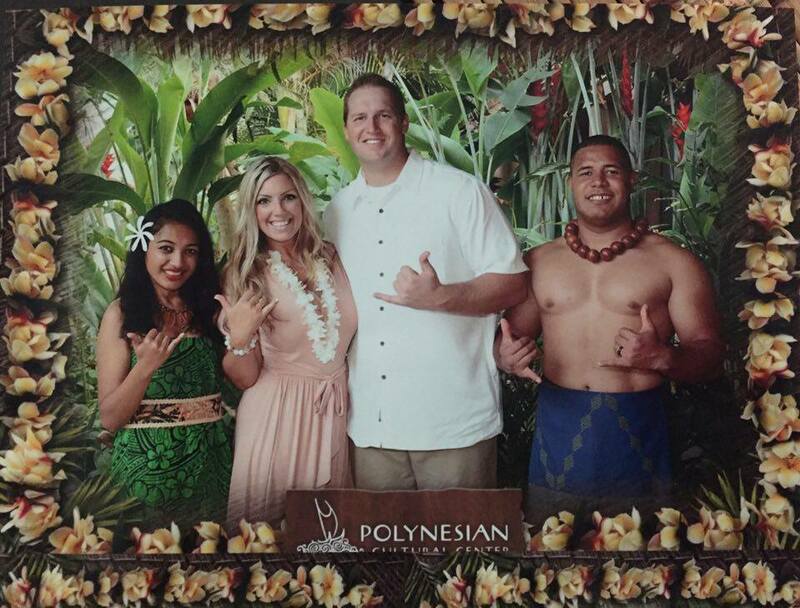 Just like the Polynesian Cultural Center (above and one of my favorite attractions on the island of Oahu and a “must do” when traveling there), we took the kids and “visited” different islands throughout the luau dinner. 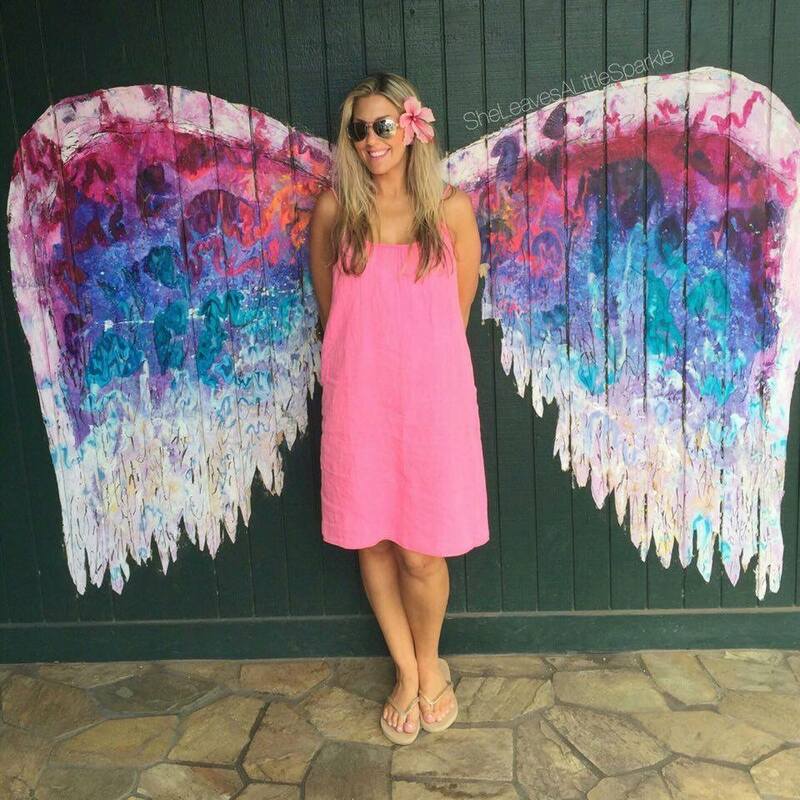 The famous wings are a hot picture spot in Haleiwa, the cutest surf town, and one of my favorite spots. If you know me well, you know I grew up dancing in a Halau called “The Mahalani Dancers” since I was a small girl and have learned about each Polynesian culture and their respective dance styles. While eating, I got up and performed a hula from Hawaii and then also did a Maori dance with poi-balls from New Zealand, a Tahitian dance from Tahiti, and a Samoan dance from Samoa. Neither my children, nor my husband, have seen me dance much over the years so it was great fun and their reactions were priceless! 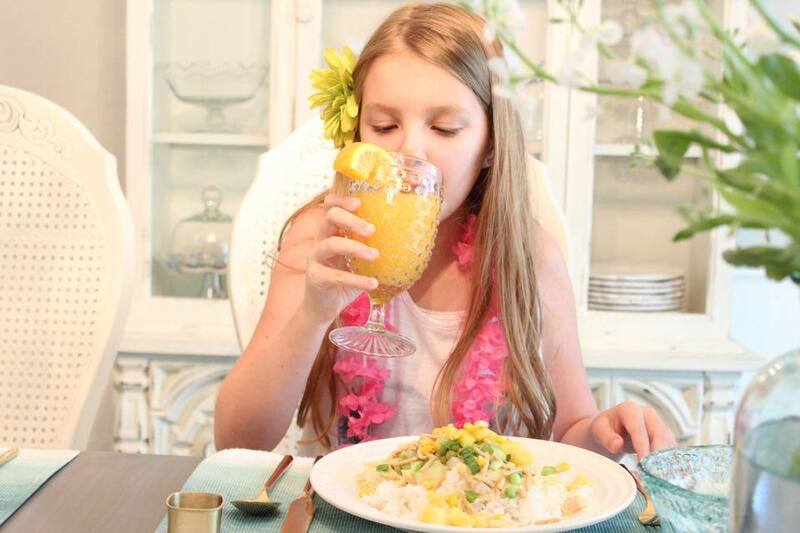 Even picky kids like Hawaiian Haystacks! 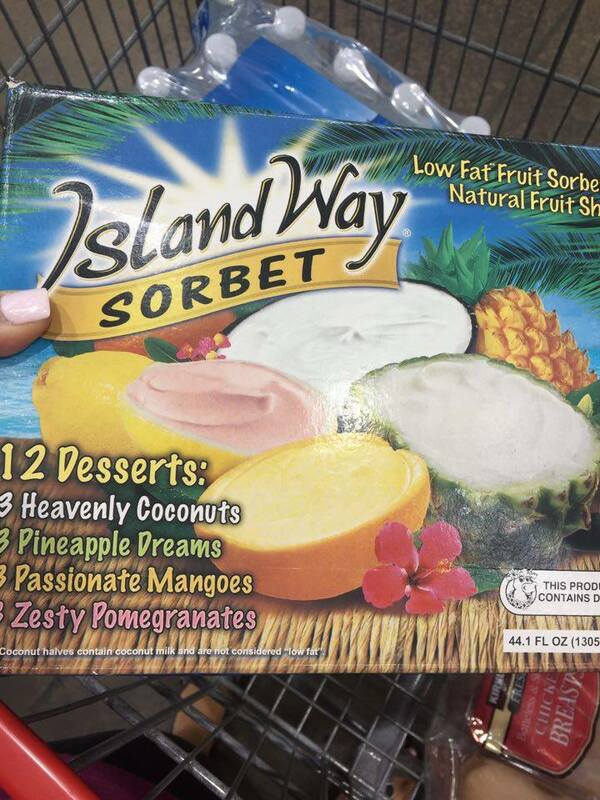 My kids had never had these so I knew I had to do it instead of a traditional luau dinner. I wasn’t really in the mood to roast a pig…ha! It’s easy and delicious and you probably have most of these items in your pantry and fridge already. Here’s the recipe. It was hard to try and capture a picture since they were so excited and dishing it up so quickly! Mix cream of chicken soup and milk in a sauce pan until smooth. Add diced chicken and simmer for 5 minutes. 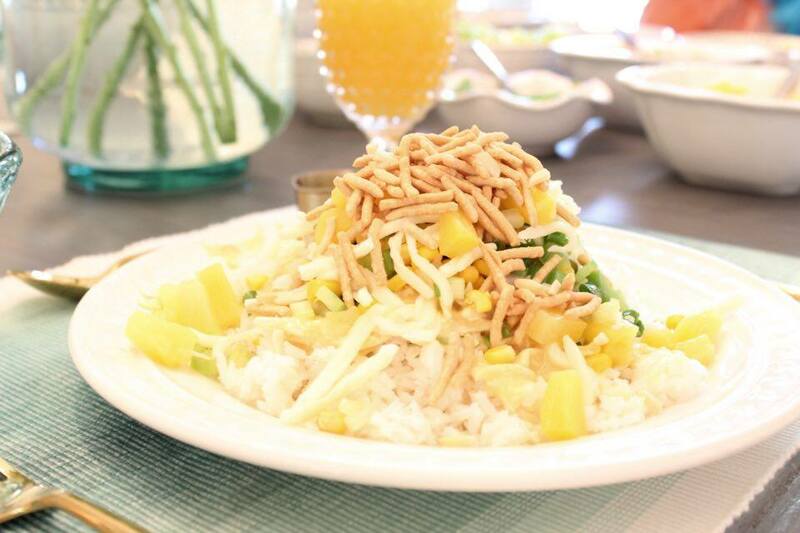 Serve hot over rice, and top with your favorite toppings! For the drink, I just bought some pineapple juice from Trader Joe’s and added an orange slice as a garnish. We eat fruit constantly in Hawaii so a fruit platter was an obvious side. If only we had had fresh mango and papaya! 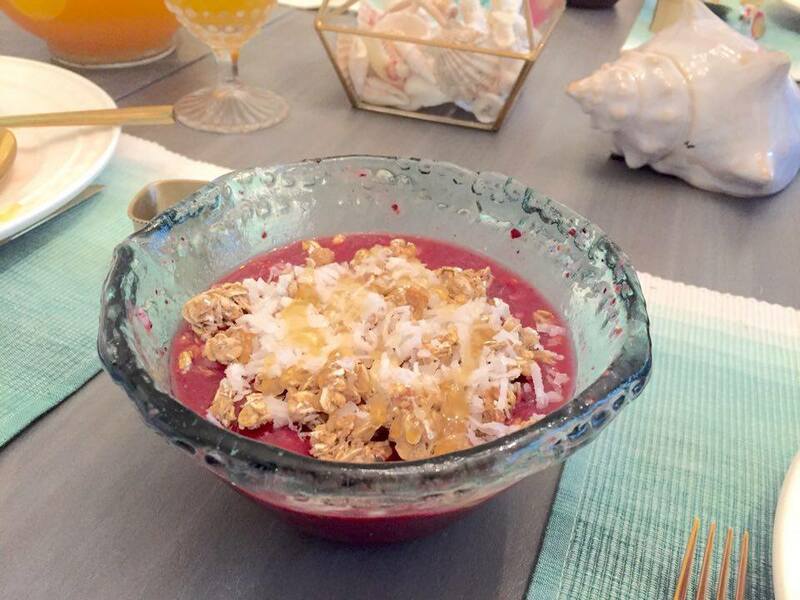 Have you had an Açai Bowl before? If not, you are missing out! We go to Haleiwa daily and get one (thus, another reason we come back a few lbs heavier). They are hard to match, with that delicious granola and coconut and honey on top but here’s my recipe that I swore was almost identical. We had to make them for the kids and they were a hit! Add to blender until a thick smoothie consistency. 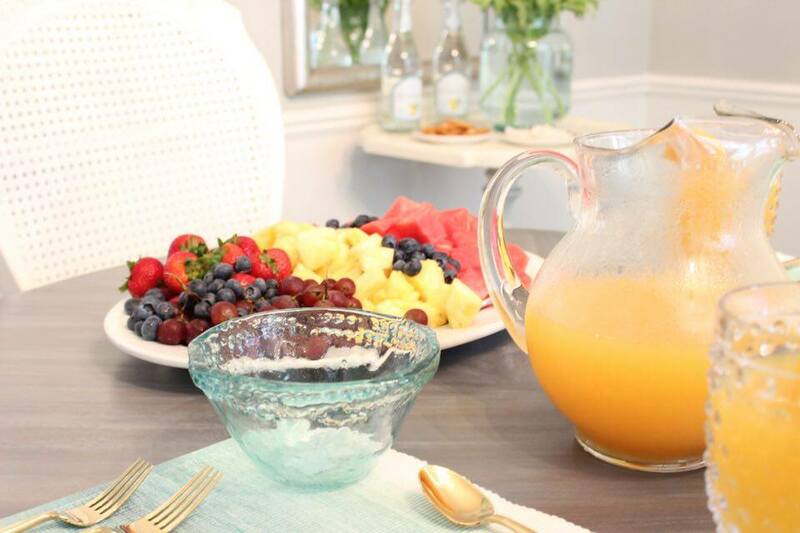 Top with fruit if desired. I like sliced bananas, shredded sweetened coconut, granola and lots of clover honey! They come like this! 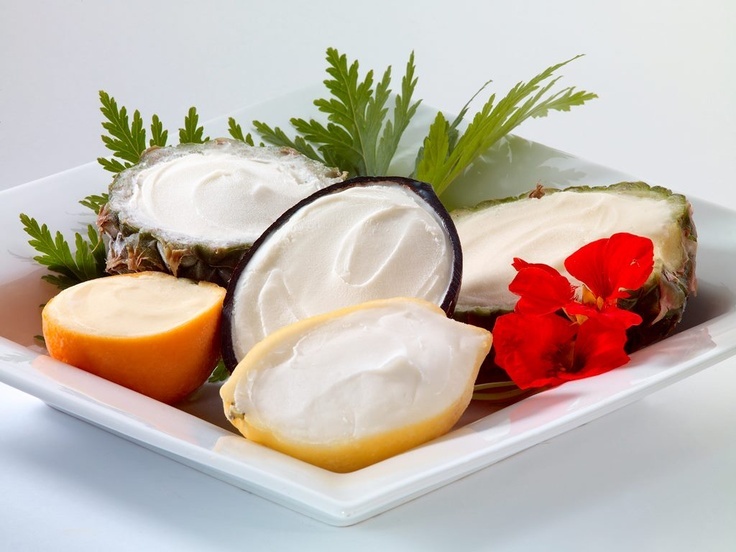 Sorbet served in frozen fruit halves….brilliant! I found everything for my table at Home Goods this time, some of which I already had, except for the gold flatware from Target which you purchase HERE. 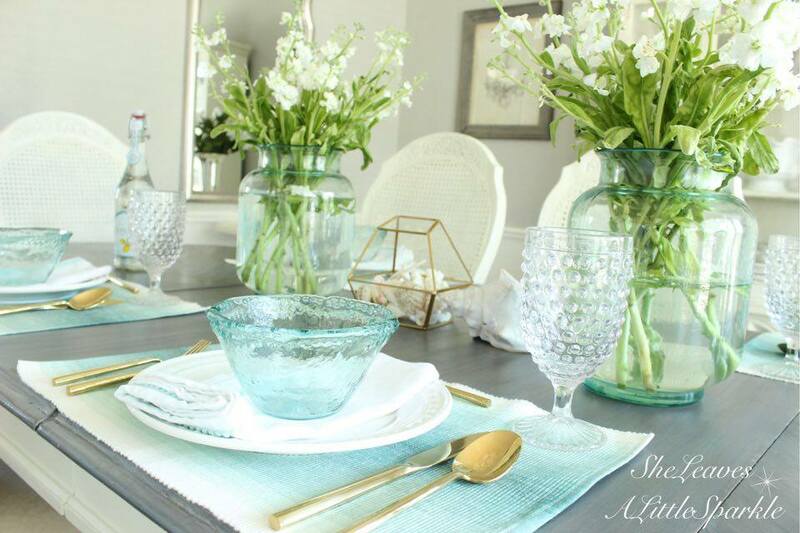 Can you believe it’s only $20 for per place setting? 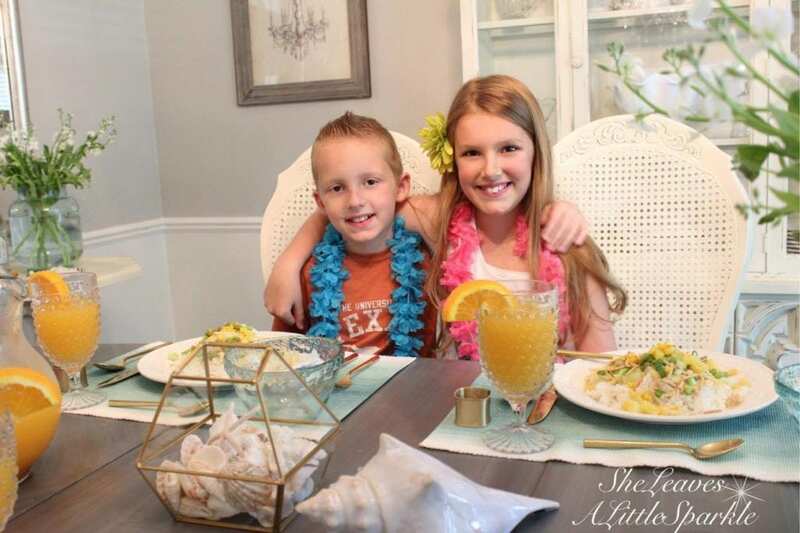 Using a terrarium filled with our shells that we brought back from Hawaii (as well as other tropical destinations) was a special piece to use on the center of the table. I added a ceramic shell I also had here at the house. 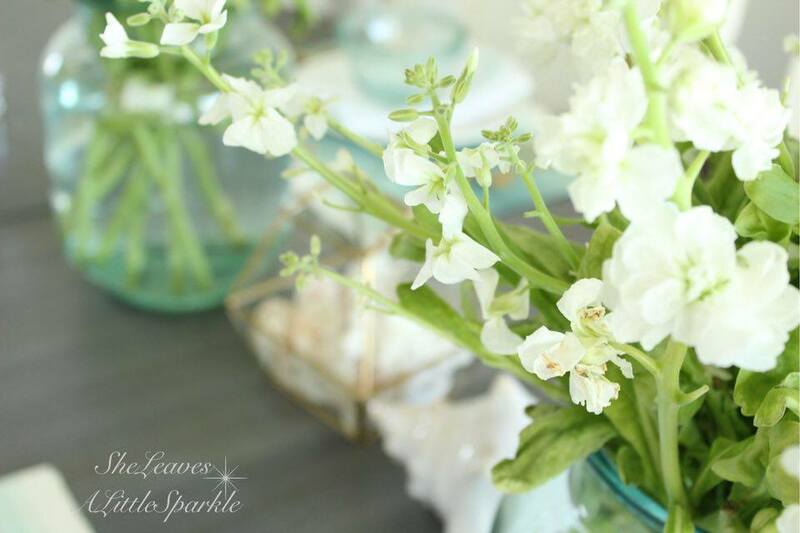 Trader Joe’s was carrying some lovely white stock flower stems and, while they may not be palm leaves or hibiscus flowers, felt like the perfect choice on this table. They are bright, lovely, and gave that height I needed for the arrangement. 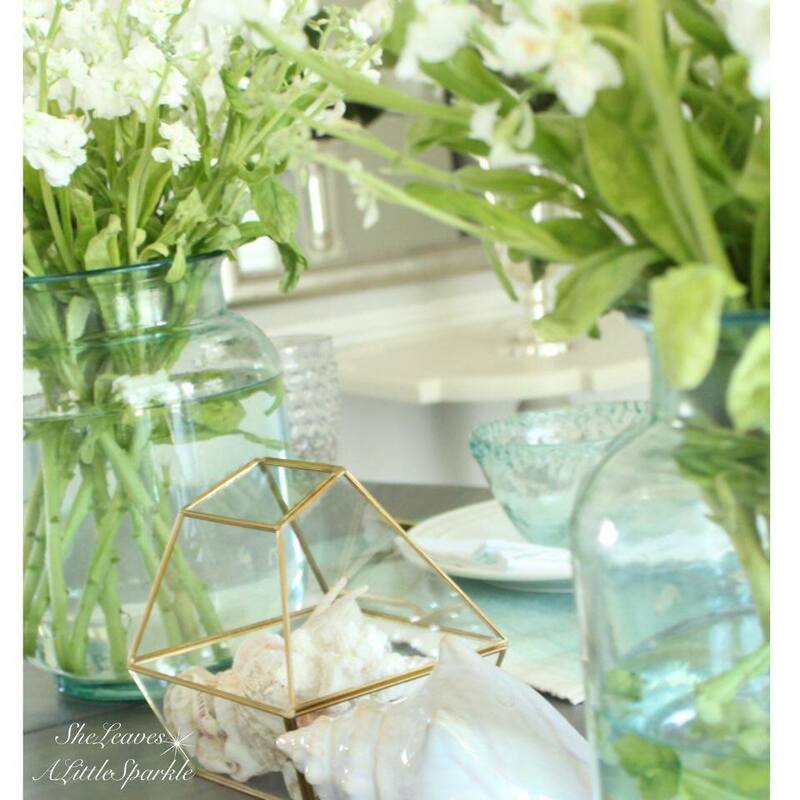 I love this aqua and white beach feel. 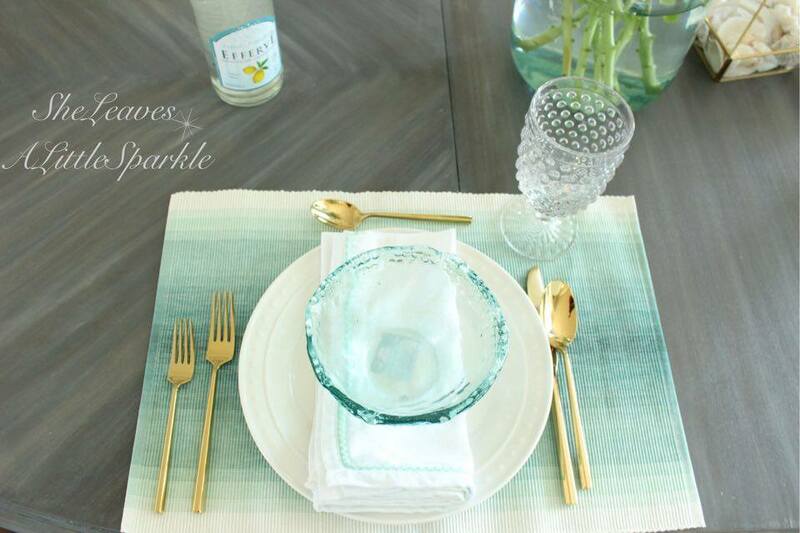 Especially the ombre placemats….all the aqua reminds me of the ocean along the shore. 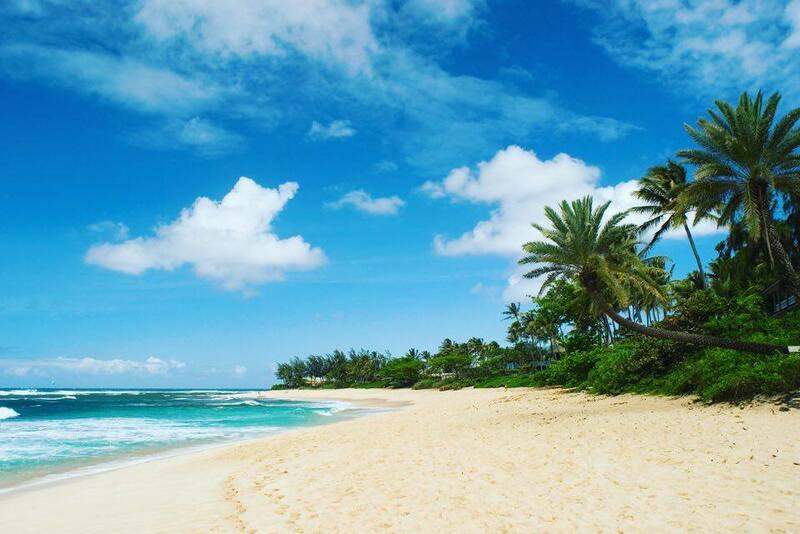 Hmmmm….now I’m day-dreaming and wishing I had another Hawaii trip planned soon. It really was the perfect trip! 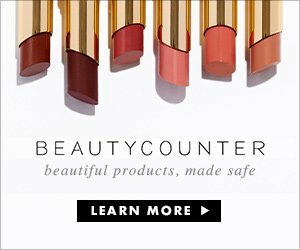 Love the whole theme and post, Summer! Nice job! !